Spiderwort is a common wild plant that is also cultivated in gardens in many countries. There are approximately 70 species of this perennial plant with the Virginia spiderwort being one of the most common. 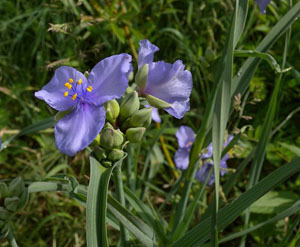 Virginia spiderwort is native in most eastern areas of Canada and the U.S. It was introduced to Europe in the 1600’s as a plant to cultivate in gardens. For those living in the central area of North America it is important to be sure you are foraging Virginia spiderwort; the Western spiderwort (Tradescantia occidentalis) is a threatened plant in Manitoba, Saskatchewan, Alberta and 19 American states. Distinguishing Features: Virginia spiderworts grow in erect clumps that can reach up to 60 cm in height. They have rounded stalks that are either single or branched at the base. This is a perennial plant that flowers (depending on location) anywhere from May to October. Seeds ripen between August and October and the flowers are generally a bright blue. Flowers: The flowers are slightly fragrant, measuring 2 to 5.5 cm in diameter. The spiderwort flowers grow in terminal clusters. The three broadly ovate petals are generally bright blue but depending on various circumstances, they are sometimes violet, purple, rose, and (rarely) white. Individual blossoms are short-lived (one or two days), but new blossoms appear daily throughout the blooming period. The spiderwort flowers are hermaphrodite. Fields of Nutrition has medicinal benefits and vitamin/mineral content of Spiderwort. Leaves: Virginia spiderwort leaves are unique and tend to wrap around the stem. Leaves are dark green (or olive) and can grow to lengths of almost 30 cm long and 2 to 3 cm in width. They have smooth margins and parallel venation. Due to their length they often bend over at the middle. Leaves are linear to broadly linear having a wide base and narrow to a pointed tip. Height: The Virginia spiderwort grows anywhere from 30 to 60 cm in height. 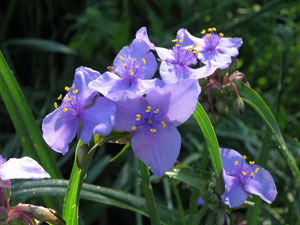 Habitat: Virginia spiderwort is found growing in woodlands, hillsides, stream banks, hillsides and in moist prairies. This plant prefers moist soil but tends to adapt to drier areas when need be. It also is found in pH balanced or alkaline soils. It also prefers shady or part shade locations. Externally, this plant can be used as a poultice to help heal wounds and hemorrhoids. Internally the leaves and roots are a valuable alternative medicine used by medical herbalists for their patients as an antidiarrheal, analgesic, anthelmintic, antiperiodic, astringent, diaphoretic, emetic, emmenagogue, expectorant, sedative, tonic, vermifuge, and vulnerary. Also, drinking spiderwort tea is supposed to be a good for increasing breast milk (Galactagogue).